Only about one month left till your little fashion diva will go back to school. Are you preparing her back-to-school wardrobe? 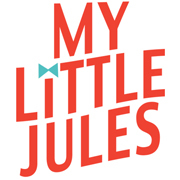 Then check-out these 5 must-have back-to-school outfits, personally approved by our Little Jules. Although, Jules is too small for school, she knows a thing or two about kids fashion and how important it is to feel comfy while also staying in style. So, here it goes. This outfit screams personality, creativity and fun. Your little fashionista will love Catimini's comfy fabrics and unmatched funky style that will put her in the spotlight anywhere she goes! When Misha Lulu met Hello Kitty, great thing were bound to happen. 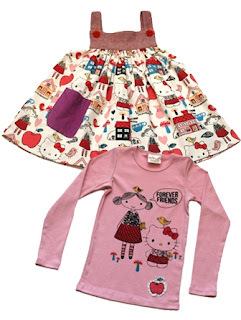 This sweet girl outfit will inspire her to make new friends and have more fun in the company of adorable Hello Kitty and Misha characters. Add a pair of Hello Kitty BabyLegs leg warmers to complete the look. Your little diva will love this cool-girl look from Kate Mack. Perfect for school days and special outings, this outfit will keep her warm, cozy and looking fly during the colder months. Fancy meets comfy in this soft knit Sugar Tunic outfit from Persnickety Clothing. Your little princess will love running around in loose-fitting bell pants. Elegant top adds flair with dazzling fabric combination and contrast tie belt. Throw on a pair of Blue Double Ruffle Bells and she is ready to shine at any special occasion. And last, but not least, this swing- and hollywood-inspired spiffy outfit for uber cool girls will turn you punk-rock princess into a real eye-candy and might, as well, become her favorite outfit this coming fall season. Now available at our online kids clothing boutique!